This Valentine's Day word search gets your kid to learn holiday-themed vocabulary. Try this Valentine's Day word search to bring learning into your celebration. Encourage your child to learn more about the African-American struggle for equality with this word search that's full of important terms and concepts. Decode a secret Valentine message in the spirit of Valentine's Day! Review terms and concepts all about Black History Month with a fun and informative crossword puzzle! This isn't your usual crossword puzzle. You find the answers by identifying states on the U.S. map. Got a kid crazy for Mad Libs? This summertime edition of the classic kid's game works on writing "hardware" that kids encounter in later elementary years. Give your little maths whiz a fun challenge with this maths crossword! Here's a fun board game that's sure to take the blahs out of multiplication practise. Has your student mastered her times tables and division tables? 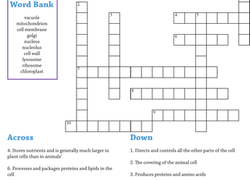 Get a fun review with this division crossword! Ten state capitals are hidden in the letter grid. Can your kid find them all? After he's finished the puzzle, challenge him to locate each capital on a map. The leaves are changing colour and falling from the trees. Fall is in the air! Your child can rake up knowledge by searching for words related to autumn. The Earth is very much alive, even its rocks shift and change. practise geology vocabulary with this challenging word search. Is your child delighted by dinosaurs? If so, he's sure to love this word search filled with hidden dinosaur vocabulary. If your mind is gathering frost this winter, warm up those brain cells with a fun winter crossword puzzle! Ready to try your hand at some detective work? Use the clues and the table provided to solve this tricky logic problem. Salut! Discover the many ways to say hello in the French language with Chris and Yannick. Challenge your young citizen to find the names of national treasures, historical buildings, and more in this United States word search! The Great St. Patrick's Day Word Search! This advanced-level St. Patrick's Day word search challenges your kid to find words like "shamrock." See if you can complete this St. Patrick's Day word search. 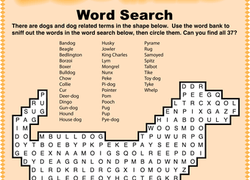 This fun dog word search is crammed with dog names and other dog-related words. Can your child find all 37? Is your kid studying electricity? Give her a break from the scientific nitty-gritty with this fun word search full of electricity terms! Gold rush worksheets can be a fun way to approach history. This board game about the California Gold Rush is a thrilling race across the Wild West! Find out what fills a room, but takes up no space, with this riddle and maths combo worksheet. Use subtraction skills to solve the riddle on this maths worksheet.